Pop life is an exhibition of hand embroideries depicting pop icons from the 80s and 90s in humorous and witty compositions. Reminiscing over childhood and teenage idols I work with embroidery to present pop icons in irreverent and gender challenging thread paintings. 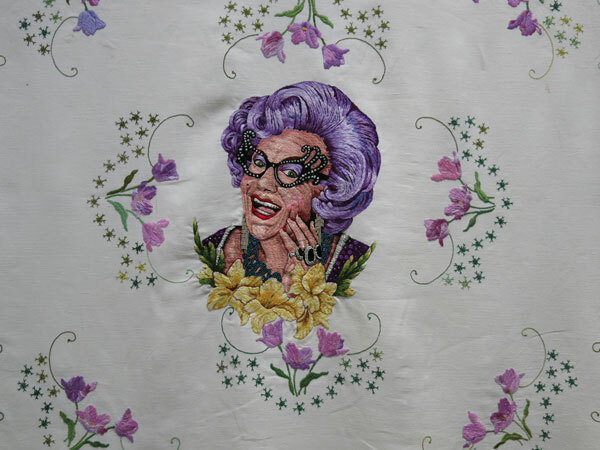 The works offer a postmodern take on needlework, readdressing the craft vs art debate and revaluing what has previously been seen as ‘domestic’ and women’s’ work. I seek to challenge the pre-conceived notion of the feminine arts as well as flipping the ‘male gaze’ that occurs in pop music and movies. Inspiration for the work stems from my childhood attending Catholic schooling, whilst coming home and dancing in front of RAGE wanting to be just like Madonna and Cyndi Lauper. The title references the late music artist Prince’s song of the same name. Whilst my works do pay homage to those celebrities and characters that were popular during my childhood, they also take a stab at the celebrity worship that happens within our society. Placing humans on a pedestal, and the idolization of those who seem more beautiful and talented than us, played out through the rehashing of religious iconography and references to classical art. Nicole O’Loughlin is a multidisciplinary artist who works in printmaking, painting and most recently self taught in embroidery. Her works have been finalists in national art prizes and have been curated into exhibitions in the United States. To see more of her work visit www.nicoleoloughlin.com and vist her instagram @nicole_p_oloughlin to see the progress of the works over the past two years.